WW2 - Home Guard etc. SRoH. Not in Stewartry Roll of Honour. 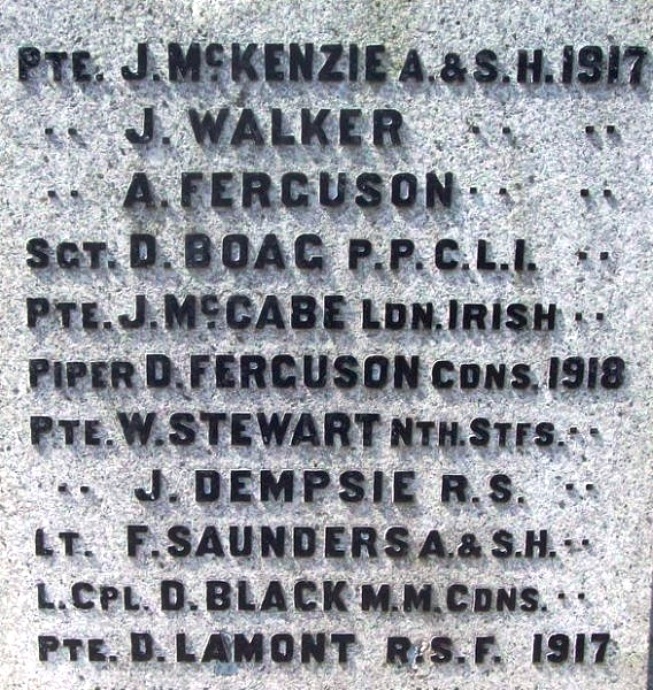 Identified as a soldier from Anwoth & Girthon ex Kirkcudbrightshire Advertiser “First Instalment of Stewartry Roll of Honour” 25th December 1914. Private William Robertson 5th King’s Own Scottish Borderers. Private J Rowan 5th King’s Own Scottish Borderers. SRoH. Not in Stewartry Roll of Honour. 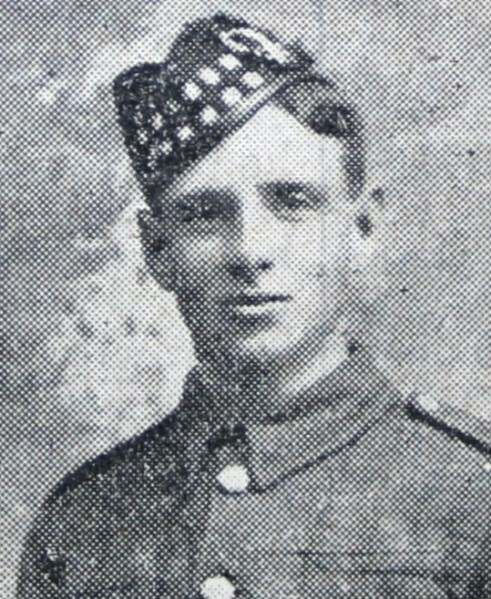 Identified as a soldier from a photograph in the Kirkcudbrightshire Advertiser 15th September 1916 as Pte. A. Roy, Gatehouse (wounded). Medal Index card : Pte. 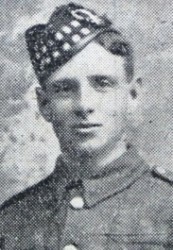 Alexander Roy, Gordon Highlanders 11912 (was 11912/6 but 6 crossed out). Awarded Victory, British and 15 star medals. Entered war in France - 09/12/1915. D of W (date of wounding?) 03/08/1916. 1901 Kilmarnock Census at 19 Clark Street: Alexander Roy (3, born Kilmarnock) with father Alexander Roy (28, house painter, born Irvine) and mother Mary (27, born Belfast). Kirkcudbrightshire Advertiser 8th September 1916 : Pte. Alexander Roy, grandson of Mrs McMillan, Fleet Street, Gatehouse of Fleet, has been wounded by shrapnel in the face, but is progressing favourably. 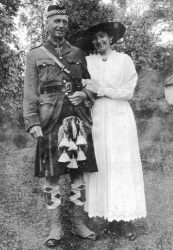 He belongs to the Gordon Highlanders, and joined the Army in 1915, and has been 11 months in the trenches. Private Roy is well known in Gatehouse. His parent's reside in Kilmarnock. Anwoth Parish Banns: 26/07/1896 at Anwoth Manse, Alexander Roy from Kilmarnock married Mary Brown McMillan from Anwoth. Gatehouse link : Spent time in Gatehouse with his grandmother Mrs McMillan and married Mary McMillan (relative ?) from Anwoth. SRoH. Captain George Salmond. Home : Kirkmabreck House, Creetown. Mobilised 4th August 1914 as 2nd Lieutenant 1/5th King’s Own Scottish Borderers. Transfered to 4th Reserve K.O.S.B. and to staff of Highland Reserve Brigade. Promoted to Adjutant and permanent Captain, June 1916. Served in Gallipolli. Awarded 1914 -15 Star. Pre–war service : 2 years with 5th K.O.S.B. Medal Index Card : 2nd Lieut. George Salmond 1/5th Bn. KOSB. Lieut.Captain & Adjutant 4th (Reserve) Battalion (KOSB). Awarded Victory, British & 15 Star medals. Sent to Gallipoli 18th May 1915. 1891 Liff & Benvie Census (Forfar) at Annfield Street : George Salmond (11, born Forfar) with parents George (39, marine engineer) and mother Catherine (38) + 2 siblings. 1901 Liff & Benvie Census (Forfar), 72 Peddie Street : George Salmond (21, born Dundee) with widowed mother Catherine (48) + sister Jessie (24). 1911 Anwoth Census, Fleetside School House : George Salmond (31, head teacher, born Forfar) with wife Ethel (30, born Dundee) + son Ivor (5, born Kelton) & daughter Lena (3, born Anwoth). George & Ethel had been married for 9 years and had 3 children, but only two were still living. Private Rennie enlisted with the K.O.S.B. on the same day as Lieut. 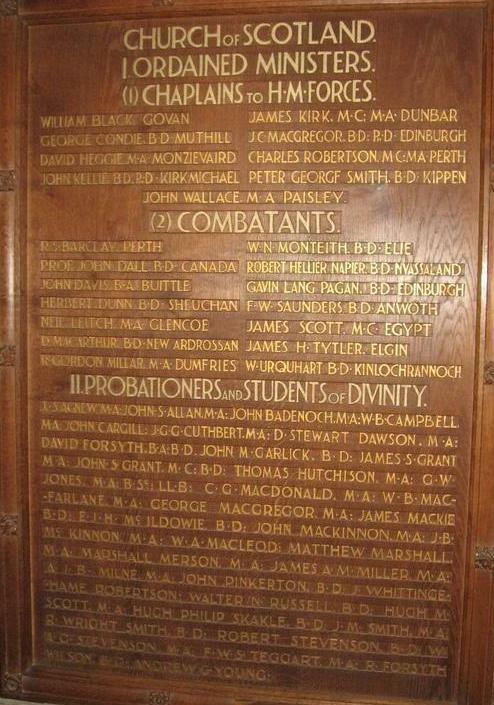 Salmond and served with him in Gallipoli. In 1918 George and his family moved to Creetown where he became the headmaster at Kirkmabreck School. They lived at Kirkmabreck House, Creetown. When daughter Ethel was killed in 1944 in Newcastle her parents names were given as George & Ethel Salmond of Dumfries. 1901 marriage of George Salmon to Ethel Grieve in Dundee City. 1907 birth of Ivor Salmond at Kelton. 1907 birth of Lena Grieve Salmond at Anwoth. 1909 at Anwoth birth of Ethel Grieve Salmond and also the 1909 death of Ethel Grieve Salmond (aged 0) at Anwoth. 1911 at Anwoth birth of Doreen Catherine Salmond (after the1911 census). 1914 at Anwoth birth of Ethel Salmond. Gatehouse link : George Salmond was headmaster at Fleetside School, Anwoth 1906 to 1918. SRoH. No known records in Roll of Honour. Anwoth & Girthon War Memorial, Gatehouse inscription : F.W. 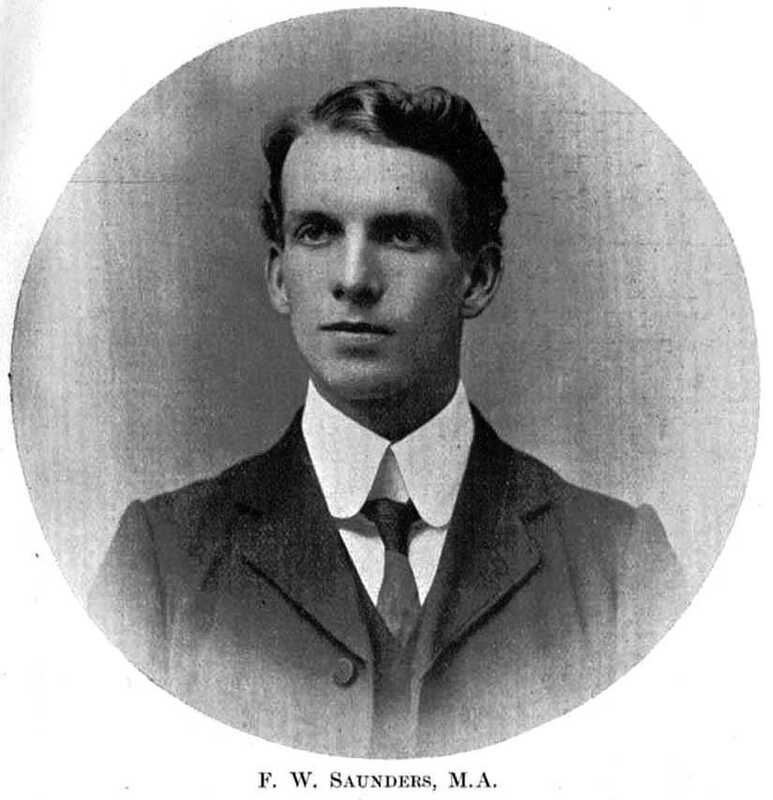 Saunders Lieut. A.& S.H. 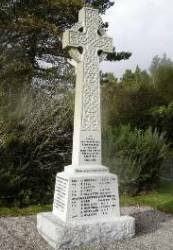 Kingarth War Memorial, Bute inscription : Lt. F. Saunders, A&SH 1918. 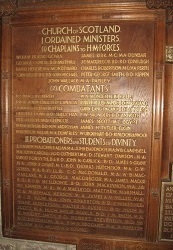 Anwoth Church Memorial : Lieutenant Frank William Saunders Argyll & Sutherland Highlanders. Minister of this Parish 1907 – 1918. 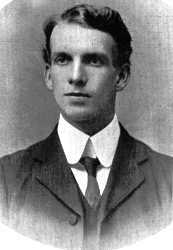 CWGC : Frank William Saunders died 1st August 1918 aged 37. Buried at Oulchy-le-Chateau, Aisne, France, in the church extension Grave 11.A.4. Wife : Jenny C Meiklejohn Saunders of Anworth, Craigmore, Bute. 1891 Bute Census, Kingarth Manse : Francis W.Saunders (9, born Kingarth, Bute) with father Rev. John Saunders (38, Parish Minister, born Portsoy, Banffs.) and mother Katherine E. Saunders (31). 1901 Falkirk Census, Maggie Wood’s Loan Dunrowan : Francis W. Saunders (19, Student of Arts, born Kingarth) was visiting the Ferguson family. 1911 Anwoth Census, Anwoth Manse : Frank William Saunders (29, Church of Scotland Minister, born Kingarth, Bute) with wife Janet Cochrane (27) + daughter Katherine Helen Saunders. Frank and Janet had been married for 3 years. Gatehouse and District by John Russell : Frank William Saunders became minister at Anwoth in 1907. He joined ‘Kitchiner’s Army’ in Nov. 1915. He was a lieutenant in the Argyll & Sutherland Highlanders and was killed in August 1918. A memorial service was held at Anwoth Church. www.familysearch.org: Frank was born 01/07/1881. Father: Rev. John Saunders from Portsoy, Banffshire Mother: Catherine Evans Begg. Educated at Rothesay Academy and Glasgow University (M.A. 1902, B.D. 1905). Licence from Church of Scotland Dunoon 1905, Assistant Minister at Falkirk then Anwoth in 1907. 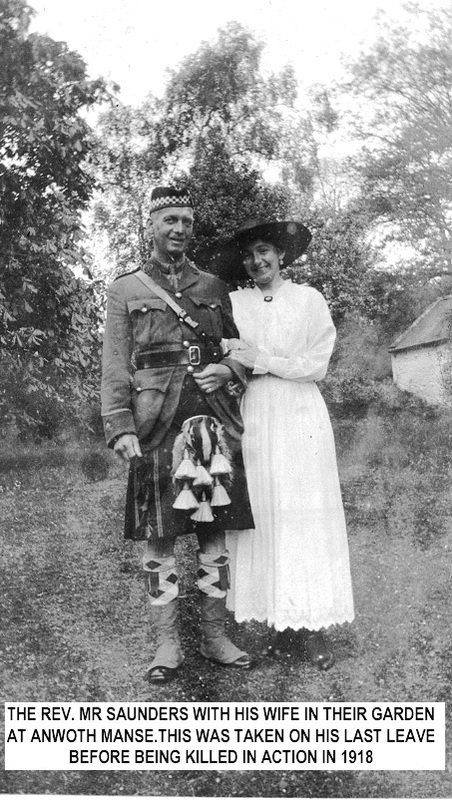 Married Janet Cochrane Meiklejohn on 17/03/1908. They had 3 children: Katherine Helen born 1910, James Begg born 1911 & Frank Meiklejohn born 1915. Frank gained an MA and a BD from Glasgow University. Gatehouse link : Minister of Anwoth from 1907 until he enlisted in 1915.